Our 18th year of water quality monitoring program started on Wednesday, May 3o. WRP staff and trained volunteers will monitor water quality at 23 swimming holes every other Wednesday through September 19. Check out the latest bacteria results, which are posted the Thursday following the most recent test date. Read the 4-page 2017 White River Water Quality Report to learn more about water quality trends in the White River watershed. In 2001, the WRP launched the first citizen-based Water Quality Monitoring Program in the White River watershed in an effort to better understand potential threats to water quality and public health. While overall water quality in the White River watershed is relatively good, problems do exist. Sedimentation and erosion are the most prominent water quality concerns, followed by elevated water temperatures, nutrients, and pathogens – all of which contribute to reduced habitat for fish and other aquatic life. The presence of pathogens and other chemicals can pose serious threats to human health as well. Since 2001, WRP staff and trained volunteers have kept tabs at 23 sites throughout the watershed, including popular swimming holes and the mouths of major tributaries. 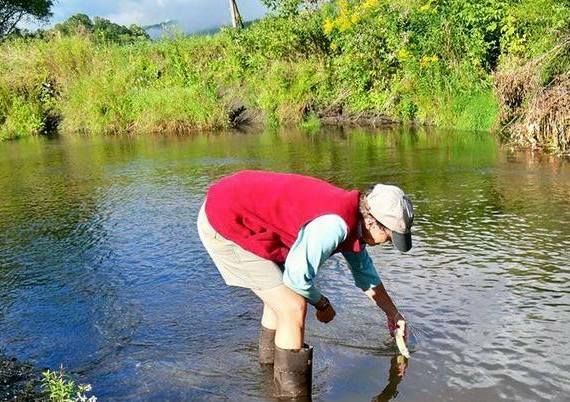 Every other Wednesday morning from June through September, we measure for water clarity (also called turbidity) and electrical conductivity (a measure of dissolved salts and other chemicals in the water, often from run-off). Our volunteers also collect water samples that are tested for bacteria. Bacterial monitoring is a practical method to determine the potential health risk of water exposure. Bacteria are microscopic, single-celled organisms that can be found in virtually any environment. Bacterial indicators of pollution are the species found in the intestines of warmblooded animals, including humans, where many pathogens also originate. Indicator bacteria in a waterway come from many sources, including animal droppings, faulty or leaking septic or sewage systems, stormwater runoff, and disturbed sediments. Because the White River watershed is a popular destination for swimming and recreating, we have been keeping a close eye on bacteria levels in an effort to better understand the potential sources of pathogens. While our existing data reveals that bacteria is prevalent in certain parts of the watershed, the swimming holes we monitor have not demonstrated a bacteria problem. Water turbidity (clarity) and conductivity are also important indicators of water quality. Turbidity indicates how clear or cloudy the water is – a high turbidity reading means that there are suspended solids in the water, likely resulting from erosion. Electrical conductivity reveals the presence of dissolved salts and compounds that originate from road run-off, pesticides, and other sources. In addition to testing the above parameters, WRP staff monitors water temperature and over 100 restoration project sites throughout the watershed. For more information about our Water Quality Monitoring Program, please contact us.